This recently refurbished first floor, Grade II listed studio flat offers well proportioned accommodation combined with stylish contemporary décor and occupying a sought-after location. The local area offers an excellent selection of amenities as the shops, bars and restaurants of Clerkenwell and the City are within easy reach. Great coffee and even better banana bread! 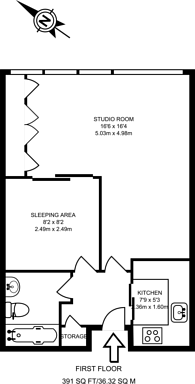 391 (36 Sq M) approx. We have over 1,000 property market reports for locations across London and Surrey - including EC1 and Barbican.